This article is about the 1942 play. 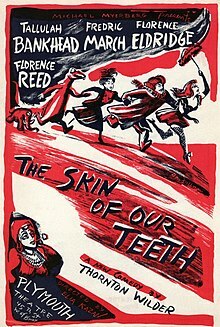 For the 1959 Australian television play based on it, see The Skin of Our Teeth (film). For the biblical phrase, see Skin of my teeth. The Skin of Our Teeth is a play by Thornton Wilder which won the Pulitzer Prize for Drama. It opened on October 15, 1942, at the Shubert Theatre in New Haven, Connecticut, before moving to the Plymouth Theatre on Broadway on November 18, 1942. It was produced by Michael Myerberg and directed by Elia Kazan. The play is a three-part allegory about the life of mankind, centering on the Antrobus family of the fictional town of Excelsior, New Jersey. The original production starred Tallulah Bankhead, Fredric March, Florence Eldridge, and Montgomery Clift. Bankhead won a Variety Award for Best Actress and the New York Drama Critics Award for Best Actress of the Year for her role as Sabina. When she left the production in March 1943, she was replaced by Miriam Hopkins. Hopkins was in turn replaced by Gladys George. For two performances, while George was ill, Lizabeth Scott, who had been Bankhead's understudy, was called in to play the role. Scott then played the role for the production's run in Boston. Originally billed in New York as "Elizabeth Scott", she dropped the "E" before taking the part in Boston, and it became her breakthrough role. The epic comedy-drama is noted as among the most heterodox of classic American comedies — it broke nearly every established theatrical convention. Act one is an amalgam of early 20th century New Jersey and the dawn of the Ice Age. The father is inventing things such as the lever, the wheel, the alphabet, and multiplication tables. The family (the Antrobuses) and the entire north-eastern U.S. face extinction by a wall of ice moving southward from Canada. The story is introduced by a narrator and further expanded by the family maid, Sabina. There are unsettling parallels between the members of the Antrobus family and various characters from the Bible. In addition, time is compressed and scrambled to such an extent that the refugees who arrive at the Antrobus house seeking food and fire include the Old Testament prophet Moses, the ancient Greek poet Homer, and women who are identified as Muses. Similarities between the play and James Joyce's novel Finnegans Wake (1939) were noted in the Saturday Review during the play's run on Broadway. Norman Cousins, editor of the Review, printed a short article by Joseph Campbell and Henry Morton Robinson titled "The Skin of Whose Teeth? The Strange Case of Mr. Wilder's New Play and Finnegans Wake" in the issue for December 19, 1942, with a second part in the February 13, 1943 issue. ^ Campbell, Joseph. Mythic Worlds, Modern Worlds: On the Art of James Joyce. New World Library, 2004; pp. 257-69. ^ a b Campbell, Joseph (2004). Kudler, David (ed.). Pathways to Bliss: Mythology and Personal Transformation. Novato, CA: New World Library. pp. 122–123. ISBN 1577314719. ^ Ben Brantley, "Review: In ‘The Skin of Our Teeth,’ the End of the World as We Know It", The New York Times, February 28th, 2017. ^ Obie Award, 2017 Winners. Al Hirschfeld (15 November 1942). "The Skin of Our Teeth". The New York Times. Retrieved 2008-07-10. Unavailable 30 September 2018. Wikimedia Commons has media related to The Skin of Our Teeth.